CSUN has received national honors for its ongoing efforts to create a diverse and inclusive campus. Photo by Lee Choo. California State University, Northridge’s ongoing efforts to cultivate a diverse and inclusive campus community are earning national recognition from two organizations dedicated to supporting and celebrating diversity. Insight into Diversity, the nation’s oldest and largest diversity publication in higher education, has given CSUN its Higher Education Excellence in Diversity (HEED) Award, which recognizes U.S. colleges and universities that demonstrate an outstanding commitment to diversity and inclusion. Minority Access, a nonprofit committed to increasing diversity, is honoring the university this month at its National Role Models Conference as an institution committed to diversity for 2017. 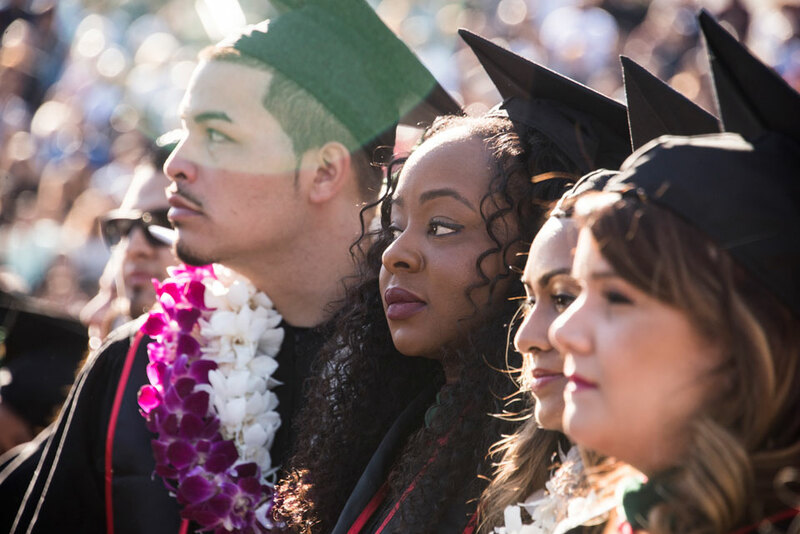 The Wall Street Journal/Times Higher Education College Rankings also recently placed CSUN as second in the nation for diversity. Susan Hua, CSUN’s interim chief diversity officer, said the­ honors recognize the university’s commitment to ensuring that everyone on campus — students, faculty and staff — feel welcomed, valued and supported. “Such recognition also signals to members of our campus community that diversity is not to be taken for granted, as it requires intentional efforts to build equity for all — at all levels of the university,” Hua said. “We are lucky to have such a diverse student population. Sustaining an inclusive environment and preserving diversity means we must continue our trajectory of mindfulness around issues of inclusion and intersectional identities. In his email to Hua notifying her of the Minority Access honor, Mason Monroe, director of the organization’s National Diversity & Inclusion Internship Program, said CSUN was being recognized for its current commitment to diversity. Lenore Pearlstein, co-publisher of Insight into Diversity, said the HEED Award process consists of a comprehensive and rigorous application that includes questions relating to the recruitment and retention of students and employees — and best practices for both — continued leadership support for diversity, and other aspects of campus diversity and inclusion. This is the second year in a row that CSUN has received a HEED Award. Hua said the CSUN campus community as a whole continues to embrace the belief that inclusivity is a key contributor to the campus’s success and the success of its students and alumni. Toward that end, university officials involve students in research, community-service learning, internships, capstone and culminating projects that occur throughout the students’ time on campus. Concerted efforts also are made to hire and retain a diverse faculty and staff. “The result of these diversity initiatives has been a more focused, sustained effort toward curricular and co-curricular redesign, broadened pools of applicants and pipelines to education, and a robust support network for individuals from traditionally underserved groups,” Hua said.